Can I share a little quirk with y'all? I don't like to use bridal shower registries. I'm not sure when this distaste set in because I used them in the past, but now I cringe and run the other way. This might be partially due to the fact that I am usually buying a gift the day before the event because I am nothing if not timely, and have in the past found most everything already purchased by clearly more organized and responsible people. So I try to come up with something that 1.) I might use myself 2.) something practical and cute. 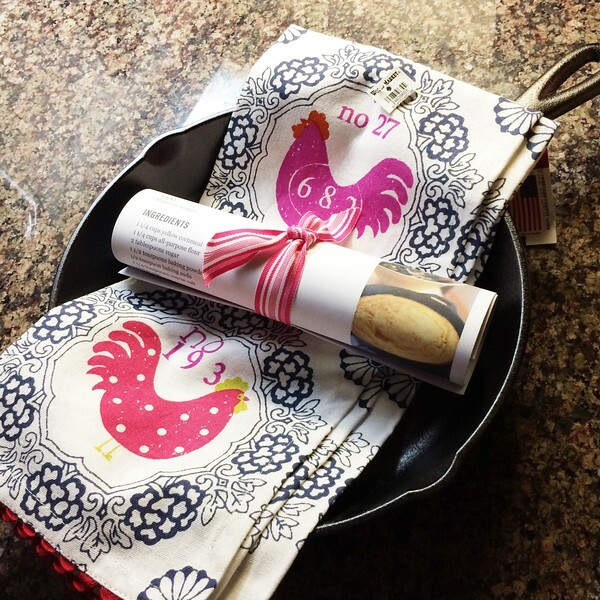 A cast iron skillet, a cute dishtowel and some recipes for cast iron skillets. After dropping and breaking my Pampered Chef skillet a few months back I made the switch to cast iron and haven't looked back. They cook evenly and quickly (there's a learning curve because they heat up fast and keep their heat, let's just say I've burned a few grilled cheeses in the process of figuring things out) and aren't difficult to clean at all (if properly seasoned) (you can scrub with coarse salt if needed and hot water, dry and wipe down with oil before storing again). After the shower I popped by Target, as you do, for essentials like toilet paper and a new DVD. 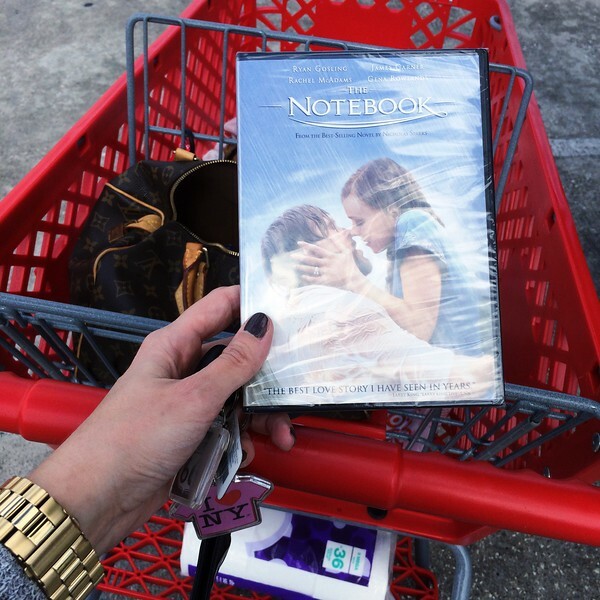 In a weak moment near the checkout I couldn't stop The Notebook hopping in my cart for $5.00. 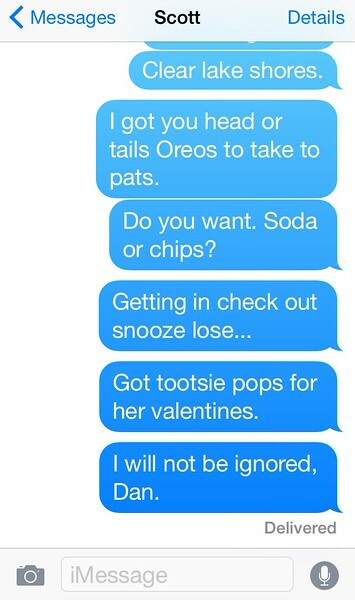 As I shopped I kept texting Scott occasionally and received no reply. So I had to get extreme. Apparently I will be ignored after all because he was outside doing yard work the whole time. And to add insult to injury he didn't get my Fatal Attraction reference. In other news I bought Tootsie Pops (see above) for Annelise's traditional photo valentines but have since been informed by Annelise that the 5th grade will not be exchanging any valentines. They're having a party outside and will be playing parent vs. student dodgeball instead. I'm the one that's crushed of course, Annelise is ALL about the dodgeball. 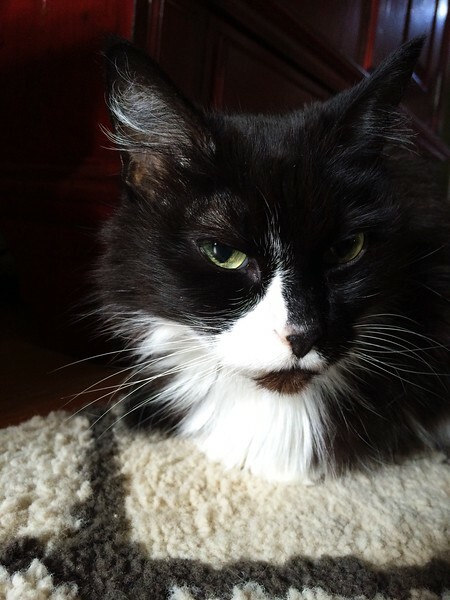 And finally, who can resist a kitty sitting in the sunlight? Of course she's probably thinking, "You've got to ask yourself one question , do you feel lucky? Do you, punk?" I completely got the Fatal Attraction reference. The scariest movie ever as my husband says...lol I would not be participating in a parent/student dodgeball game. There is no love in dodgeball, just pain.... Have a wonderful week. I will be coping that wedding gift idea, very cute. I love the gift idea! It would also be a great housewarming present! Where did you get the kitchen towel? I love that too! Thanks Kimberly! I got everything at World Market, they always have really cute dishtowels.